Teatourist has provided me with the Nourish & Flourish Collection for the purposes of providing an honest review. 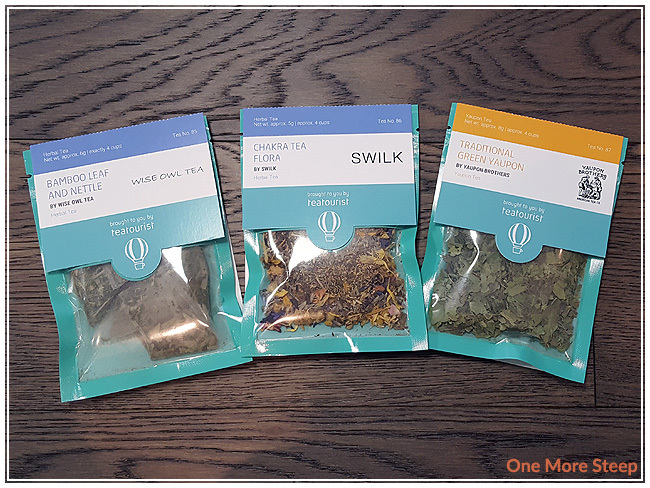 Nourish & Flourish is Teatourist’s January 2018 box – with all these wellness teas and tisanes to help you start your year off right. If you ever want to go back and order a previous curated collection, you can do so on the Teatourist website! Any boxes that you were interested in? If they have it in stock, you can order it! 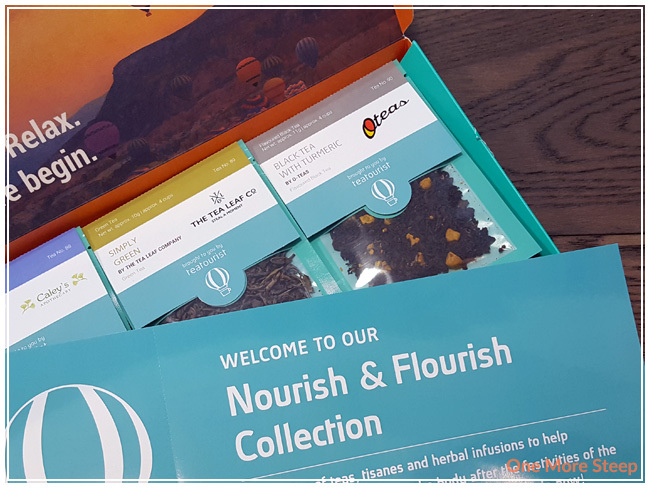 The Nourish & Flourish Collection consists of six teas and tisanes. The first three are: Bamboo Leaf and Nettle by Wise Owl Tea, Chakra Tea Flora by SWILK, Traditional Green Yaupon by Yaupon Brothers. All three are herbals/tisanes as none of them actually contain tea leaves. 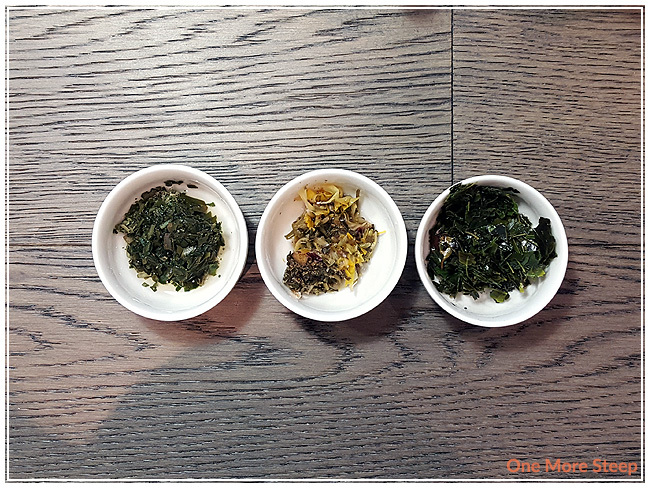 From left to right: Bamboo Leaf and Nettle, Chakra Tea Flora, and Traditional Green Yaupon. Bamboo Leaf and Nettle consists of wild picked bamboo leaf and nettle leaf, which has a very grassy aroma to it. The dry leaf actually reminded me a bit of celery of all things. This was the only blend that came in tea bags instead of loose leaf tea. Chakra Tea Flora is an amazingly floral blend. It has a very strong lavender and rose aroma to the dry leaf and all of the ingredients are easily seen – peppermint, hibiscus, lavender, marigold, chamomile, rose, and cornflower. Traditional Green Yaupon is (surprise!) a straight yaupon holly tisane, which is grown in Florida, USA. 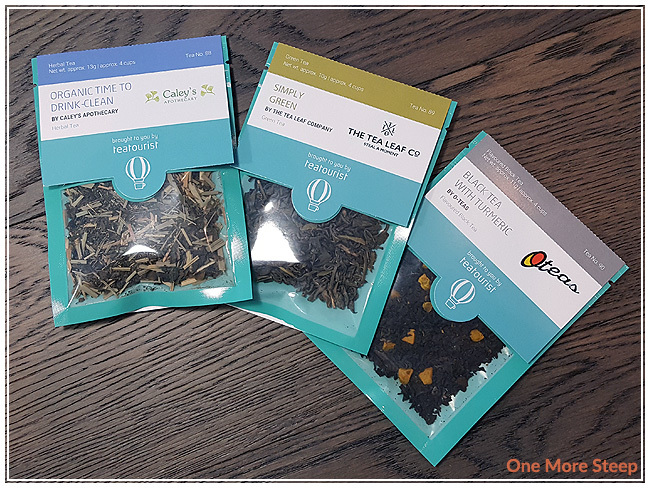 The second half of this curated collection is Organic Time to Drink – Clean by Caley’s Apothecary, Simply Green by The Tea Leaf Company, and Black Tea with Turmeric by O-Teas. 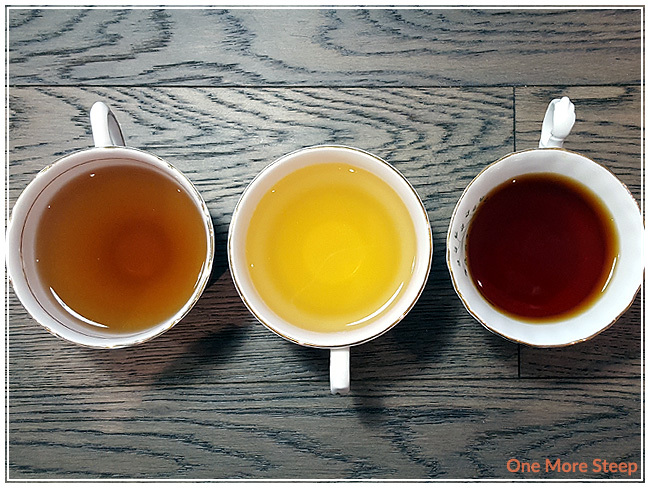 From left to right: Organic Time to Drink – Clean, Simply Green, and Black Tea with Turmeric. Organic Time to Drink – Clean has a very mild aroma to it – an interesting blend of lemongrass and grass. 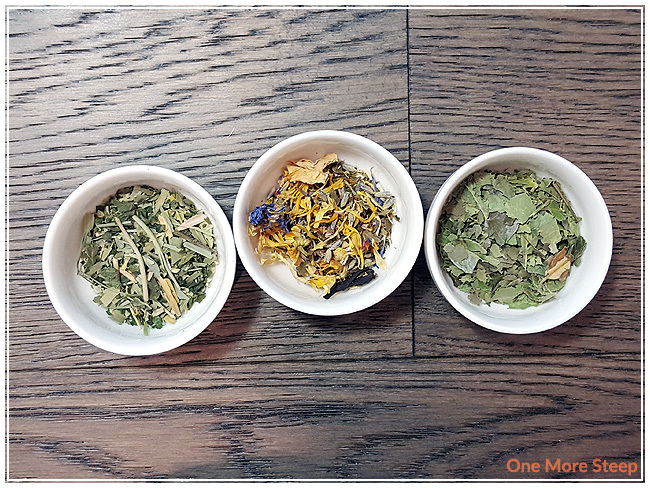 The ingredients of this blend are lemongrass, green tea, nettle, and bilberries. Simply Green is simply a Ceylon green tea and has sweet vegetal aroma with a mild licorice fragrance to it. Black Tea with Turmeric smells strongly of tumeric, and this tea is just how it sounds – black tea with tumeric. Wise Owl Tea recommends steeping Bamboo Leaf and Nettle in 70-80°C (158-176°F) for 5+ minutes. I steeped this tisane in 80C (176F) for 5 minutes. SWILK recommends steeping Chakra Tea Flora in 100°C (212°F) for 4 to 5 minutes. I steeped this floral tisane for 5 minutes. Yaupon Brothers recommends steeping Traditional Green Yaupon in 100°C (212°F) for 5 minutes. I followed the steeping instructions. Caley’s Apothecary recommends steeping Organic Time to Drink – Clean in 100°C (212°F) for 5 to 7 minutes. I steeped this herbal tisane for 7 minutes. The Tea Leaf Company recommends steeping Simply Green in 80°C (176°F) for 2 to 5 minutes. I steeped this straight green tea for 3 minutes. O-Teas recommends steeping Black Tea with Turmeric in 100°C (212°F) for 5 to 6 minutes. I steeped this black tea blend for 5 minutes. Bamboo Leaf and Nettle steeps to a yellow green and actually reminds me a lot of green tea in colour, although it’s a touch more cloudy than I’m used to. There’s some nice grassy aromas, and it tastes like it smells. There’s a slight saltiness to this tisane that adds a great umami flavour to it. I like that it reminds me of a green tea, but it doesn’t have any caffeine so it makes for a nice option. Chakra Tea Flora steeps to a reddish orange, there is a very strong mint and lavender aroma to it. It’s actually quite perfumey because of all the floral ingredients. I think this would be a nice tisane to relax with considering all the soothing floral ingredients in this blend. Traditional Green Yaupon steeps to an orange, and it actually has a really strong grassy and hay aroma do it. I found that this leafy tisane had very strong hay flavours to it, but it was missing the honeyed sweetness that was in the description of the tisane. Organic Time to Drink – Clean has an almost dark honey colouring to it. This herbal blend has very mild aromas to it – with citrus and lemongrass playing strong characters in the flavour profile. It wasn’t a very strong herbal tisane, and I mostly got citrus from it. Simply Green steeps to quite the bright sunshine yellow. It has a very subtle aroma that is easy to miss. I found that it had some great grassy and vegetal flavours to it. There was just the hint of bitterness to this tea, but a smooth texture overall. I’d recommend steeping this one for less than 3 minutes, 2 minutes would probably be better for an initial steep. Black Tea with Turmeric steeps to a very dark, warm brown. It’s smells honey sweet. I found this tea to be surprisingly strong – it’s astringent and tangy with a strong mouth-puckering amount of flavouring. There’s the slight warming sensation, and I found it to be too astringent for me to really enjoy, although the aroma is delightful. 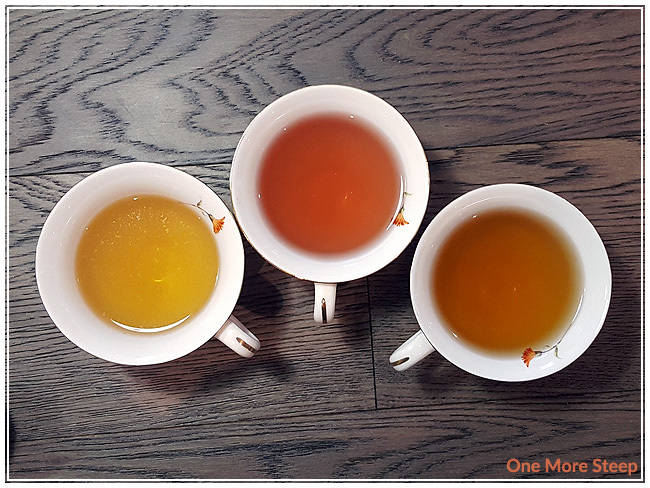 I resteeped the following and found that the flavours were much weaker compared to the first/initial steep: Bamboo Leaf and Nettle, Chakra Tea Flora, Traditional Green Yaupon, Organic Time to Drink – Clean, and Black Tea with Turmeric. 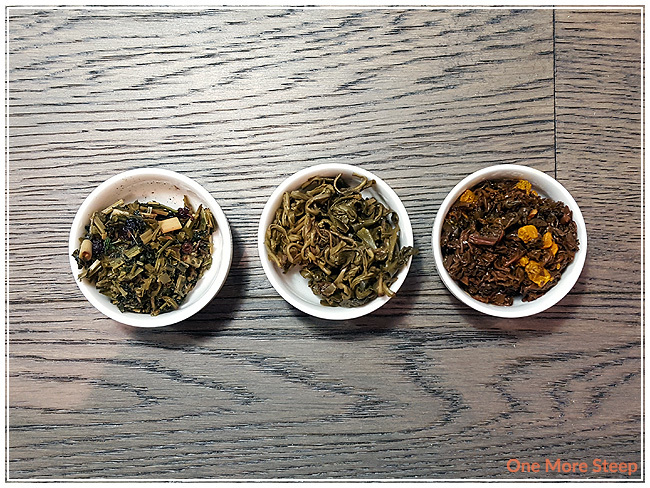 I resteeped Simply Green three times, I found that the flavour got stronger for the first resteep, and gradually waned in flavour for the second and third resteep. The balance of grassy and vegetal flavours remained the same as the initial steep. I loved Teatourist’s Nourish & Flourish Collection. 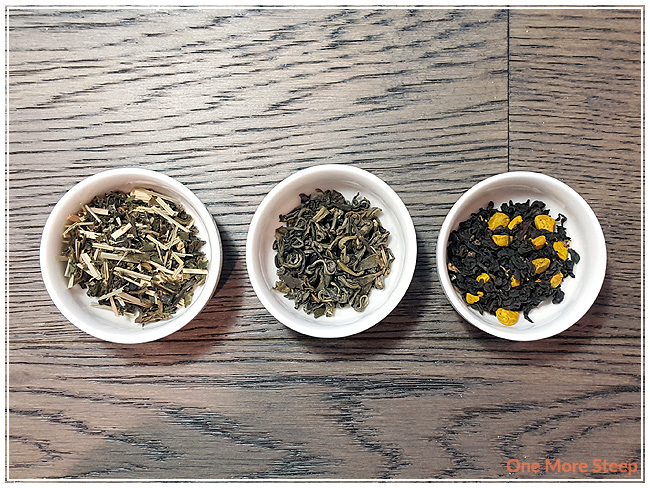 This collection has a great variety – although of the six only three contain tea, so if you’re not interested in tisanes, this may not be the collection for you. That said, I really enjoyed the variety in blends, because I’ve never tried Yaupon before, or a tea with tumeric, and I’m not sure that I would have necessarily gone out of my way to pick it up if I were just out tea shopping.